ALS. 2pp. 37 Dennington Park Road, West Hampstead, NW. 7th July 1911. To "Dear Sir" [Granville Smithurst]. "Many thanks for your kind letter and it is with the greatest pleasure that I send you my autograph on enclosed photo. Are you an amateur on the harp? How can you be an admirer of my playing without ever having heard me? Let us hope that your wish as to the future popularity of our beautiful instrument - so frightfully neglected - may become true. But I doubt that this will be the case as long as I am alive. Should you ever come to London please let me know and come to see me. Believe me yours very faithfully, A. Kastner". 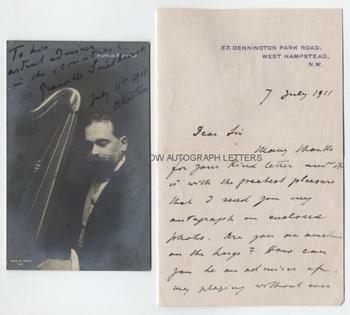 Together with a post-card photograph showing Alfred Kastner, half-length in profile, playing the harp. Signed and inscribed "To his mutual admirer in the 'country' Mr Granville Smithurst. July 11th 1911. A. Kastner". ALS is 8vo bifolium, approx 7 x 4.5 inches (18 x 11.5 cms). Mounting traces and slight surface paper damage to blank verso of first leaf, else fine. Photograph is approx 5.25 x 3.25 inches (13.5 x 8.5 cms), slight silvering to edges, else in fine condition. Alfred Kastner was born to a musical family in Vienna where he met and came under the influence of Johannes Brahms, Bruckner and his contemporary and life-long friend Fritz Kreisler. After years of touring in Poland, Russia and the Austro-Hungarian Empire, Alfred Kastner was contacted by Kreisler, who invited him to join him at Henry Wood's Queen's Hall Orchestra in London. Thus began Kastner's most fruitful period in which he appeared many times at the Promenade Concerts and was appointed professor of harp at the Royal Academy of Music and also an instructor at the Guildhall School of Music. Alfred Kastner became a household name during this period and enjoyed considerable social status, counting Prime Minister H H Asquith amongst his many friends and acquaintances. After the war Alfred Kastner joined the Los Angeles Philharmonic under Walter Rothwell but the change in musical traditions and the upheaval that followed WW1 did not suit Alfred Kastner who despaired that many of the student harpists he so carefully nurtured and trained were ending up in the newly formed radio and film industries and other less cultured musical outlets.